This LCD projector effortlessly displays bright images with vivid colours for a crisp clear picture: ideal for presentations and moving images and is aided by the 10000:1 contrast ratio. With an HDMI input high definition video and audio content are easily played with the same high quality you would expect from the world's number one projector manufacturer. With the moderator function you can easily allow others to connect and share their content over your LAN. You remain in complete control and can choose when to display content – ideal for interaction in a collaborative teaching or training environment. 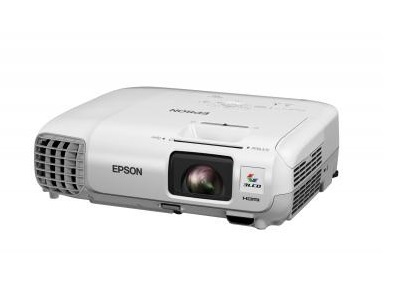 Thanks to its manual keystone slider – unique to Epson – and automatic vertical keystone correction this projector is quick and simple to set up. No matter the angle of the projector you can easily align the projection to ensure a straight and correct image. The Colour Universal Design makes operating the projector easier thanks to new LED colours and menu icons on the projectors control panel.